Once every seven years or so there comes a good year for UK tomatoes. 2013 is definitely a Good Tomato Year and we only need a little more September or even October sunshine to keep the season going throughout the autumn. The last properly good year was 2006 and before that 2002 (and before that I wasn't obsessive enough to keep records). 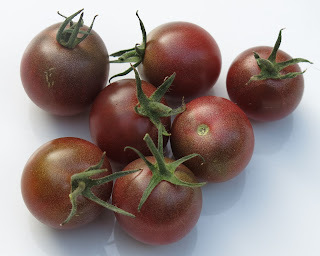 This year, I grew eight different varieties: Black cherry, Black Russian, Pink Brandywine, Super Marmande, Red Alert, Tigerella, Sungold and Wineberry. They were all raised the same way: sown indoors in February, moved outside into pots in May. Fed once a week (ish). Actually, the Sungolds were sown later, in April, for reasons of space more than anything else. They soon caught up with the others. I also grafted some Brandywine seedlings so that I have fruit from both grafted and non-grafted. I have to say the jury is out on home grafting for the moment - the non-grafted plants are yielding just as many tomatoes as the grafted specimens. 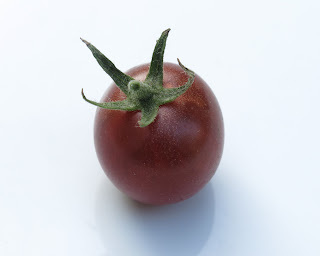 Many of the 'Black' varieties of tomato were originally cultivated in areas around the Black Sea, including Ukraine and the Crimea, hence the names of many of these - Black Russian, see below, Black Krim, etc. 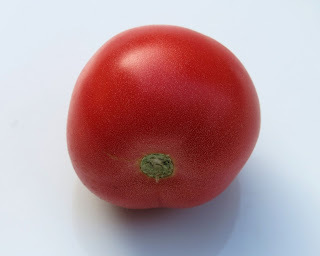 There are also tomatoes available from Siberia, and all these tend to be better at withstanding our cooler temperatures than those that have been cultivated for generations in the Mediterranean, for example. 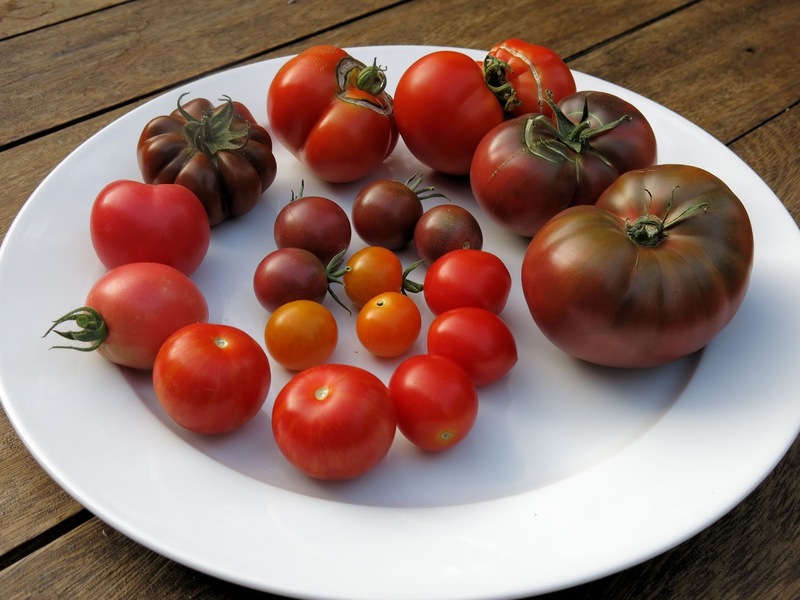 The Black Cherries were voted the best of the small tomatoes, albeit by a very small margin. With a mellow, almost smoky sweet taste and very soft flesh, they don't have that sunburst explosion that you get with Sungold. It's a much gentler sweet taste. 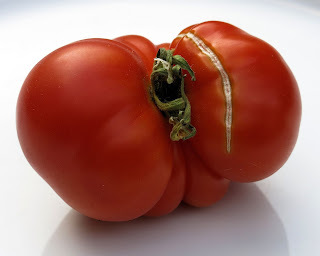 It's also been the tomato variety I liked growing the least. The Black Cherry plants were straggly and untidy, needing constant tying in and the yields are not particularly high. 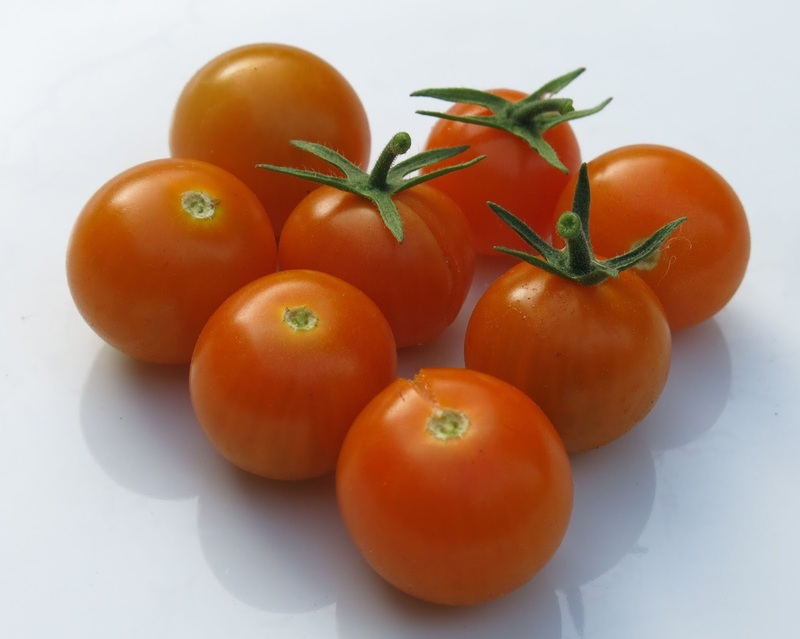 Supplier: most seed suppliers stock Sungold. This year's batch came from Kings Seeds. Familiar and much loved fruits for their sweet zingy fresh flavour. Bite into a Sungold tomato and you get a burst of sweet-sharp, honeyed flavour. These are always hugely popular with children - we have converted many a tomato-hater using Sungold as bait. 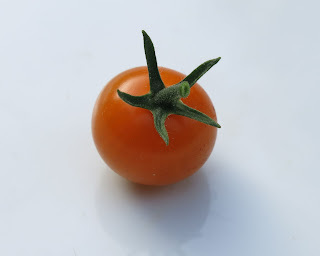 I grow Sungold every year for its reliability as well as for the taste: it will grow long trusses of regular, uniformly coloured fruit as befits its F1 status. They are extremely attractive plants once staked and trimmed, with bright green leaves and cascades of trusses heavy with golden fruit.The ripe fruits do split very easily though, even if you are careful not to over-water, which is probably why you don't see them on sale in the shops. I often sow Sungold slightly later than other varieties, not getting the seeds in until April. They catch up fast and I find the green fruits relatively quick to ripen and turn colour. The plants invariably need stopping, ie, the tops need to be pinched out after the fourth truss has been set, or else the plants would get very tall - they reach around 2m as it is - and too much of the energy would go into producing more leafy growth and less fruity growth. 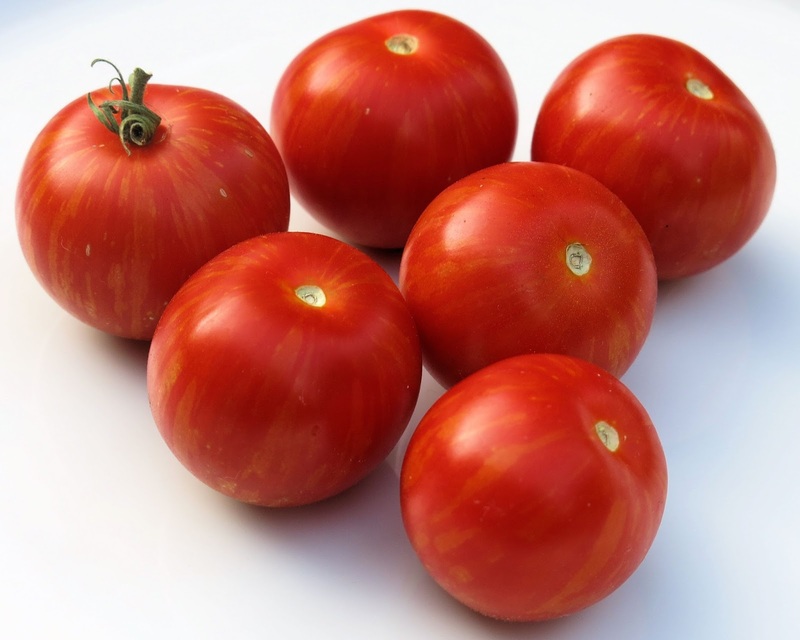 These are some of the easiest tomatoes to grow. The plants grow as a bush rather than in cordons and so don't need to have side shoots regularly removed, or as much tying in, although they will appreciate some support as the plants grow to maturity. Secondly - and the main reason for growing Red Alert - it is a reliably early fruiting tomato even when grown outside. 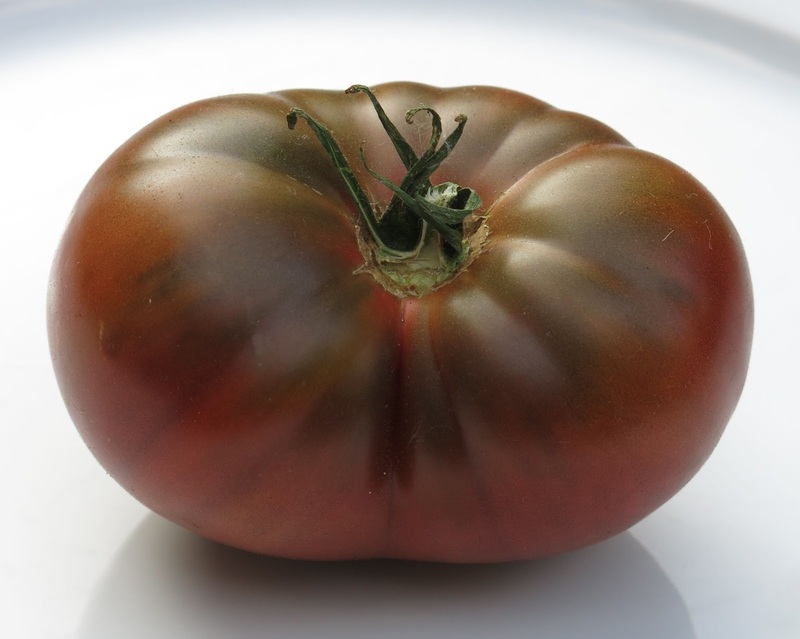 Given a warm spring (so, not this year) you be eating the first Red Alerts by the end of June. And if high summer doesn't live up to expectations (think 2012, 2011, 2010), you'll have had a fair crop of Red Alerts by the time disappointment sets in. Sadly, though, they don't compare well with any of the other varieties for taste. The tomatoes are fleshy enough, but the flavour is very bland and nondescript. A conventional round tomato with distinctive vertical stripes on the fruit. This scored well for taste: when fully ripe, the fruits have a piquant, concentrated edge to the sweetness. Good - and decorative - in salads as well as sauces. I've grown Tigerella off and on for a number of years and have found that in a poor year without a good warm spell in summer that flavour often doesn;t get a chance to develop. This variety is also very susceptible to blight (see also Black Russian, Pink Brandywine, below). This year, they've been wonderful. Another of the 'Black' types which were developed in the Crimea/Ukraine in the 18th and 19th centuries. 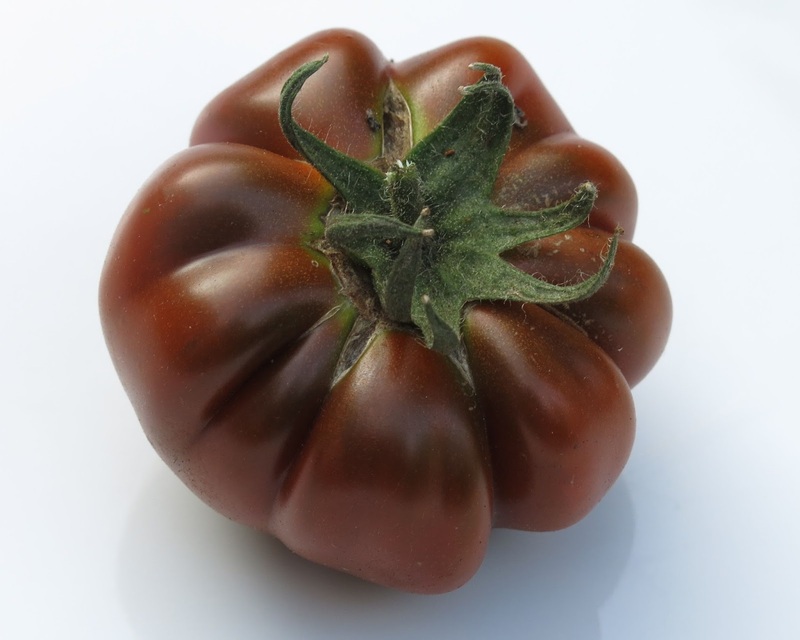 This has long been our favourite tomato for cooking: whether grilling or roasting, or to go into a sauce. The tomatoes are such a good size and very fleshy, so one Black Russian tom will go a long way. It was a surprise how much less pronounced the flavour was when raw. We concluded that if they are to be eaten raw, they should be left until very ripe. 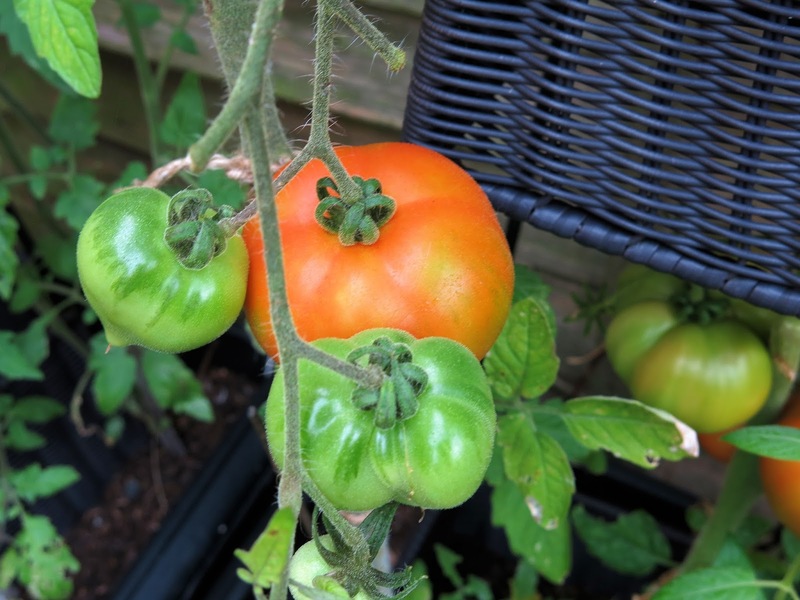 Often susceptible to blight, this year all the tomato plants have been unaffected so far and the Black Russians were the earliest to ripen of the large, 'beefsteak' varieties. The Brandywine tomatoes (there are Red, Purple and Yellow, as well as Pink Brandywines) were cultivated as a separate variety in the 1880s in the USA. The picture here doesn't bring out the unusual pink tinge to the colour of the fruit as it ripens. 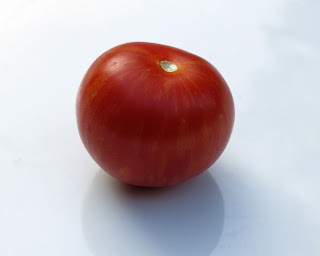 The individual tomatoes can grow very big, this one left, weighs over 350g and is just over 10cm at the widest point: great for shows so long as the judges aren't looking for regularity of shape. Like the fruits themselves, the plants, which have leaves like those on potato plants, can grow very tall. The fruits have a softer, mellower flavour than the Marmandes, below, the sweetness coming through without much of a sharp front note. In general, the Black Russians are tastier and the Marmandes more reliably productive. Pink Brandywines are one of my lower yielding tomatoes, so it's been pleasing to get so many fruits this year. If the pinkish colour and size of the fruit isn't enough of a talking point, I suspect I also grow these at least partly for the name - who could resist a tomato called Pink Brandywine? When your Marmandes only start ripening in December in London you know you're not going to get much of the flavour of Provence out of them, but picked in sunshine in a warm British August, they come somewhere close. 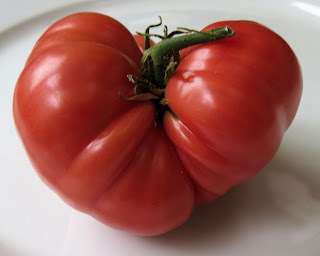 I grow Marmandes because of all the beefsteak style tomatoes I've tried these are the most reliable. Even though they can be very slow to ripen in an indifferent summer. They also have a tendency to split as the fruits swell to ripeness, as you can see from the picture. 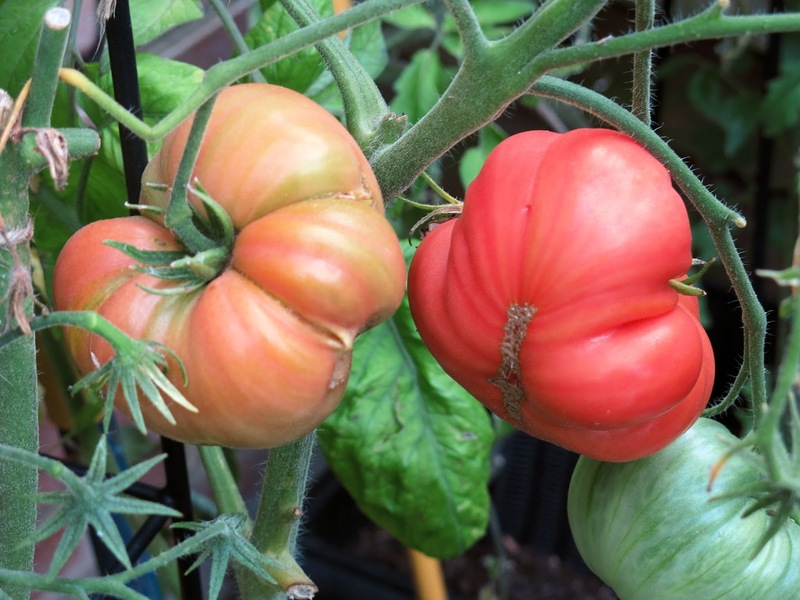 This year, the fruits have a lovely sweet-sharp combination, with plenty of rich flesh and juice in each tomato. These have been equally good in sauces and sliced into salads. They've contributed to some beautifully juicy panzanellas (tomato and bread salad) this summer, and on the same principle, my husband has also taken to making tomato sandwiches using thinly sliced and lightly salted Marmandes. I've never tried these before and they were something of an impulse buy. Advertised as having the flavour of amontillado sherry, they have grown into attractive, reasonably compact plants with these very distinctive fruits: sharply defined locules and an unusual burnt orange, auburn colour. According to the catalogues, there should be red/yellow striping on the fruits - mine have tended to lose the stripes as they ripen. So far, though, the flavour has been slightly disappointing. Not so much amontillado as watered-down cooking sherry. The fruits have a generally sweet flavour, but it's undistinguished by any extra notes. Pink Brandywines, normally a poor yielder, have done well this year.